Visiting the city for the first time or rediscovering the city again? One must-do while in Kolkata is a visit to the Kali temple at Dakhineshwar on the banks of the Hooghly. Plus, it's Kali Puja and Diwali time! A visit to Dakhineswar is a must, if for nothing else, but for its architectural brilliance. Often compared to the architectural style of Sacré-Cœur because of its multi-tiered arches and turrets, the temple was built in the year 1855 and was dedicated to Goddess Kali. The twelve-spired structure with a sprawling courtyard is flanked by twelve smaller temples that are consecrated to Lord Shiva. Built in the conventional Indian nava-ratna style, this cream and red coloured temple is one of the largest ones in Kolkata. Founded by the freedom fighter Rani Rashmoni, Dakhineswar is a good place to visit to learn about one of Bengal’s most powerful women social reformers and freedom fighter. Visit the temple office premises to read more about her feats and also about how she single-handedly managed to fight the British on several counts. Rani Rashmoni is not only credited with the construction of a road from Subarnarekha River to Puri for pilgrims, but also for the construction of the several ghats along the Ganges including Babu Ghat, Ahiritola Ghat and Nimtola Ghat, for the everyday bathers at the Ganges. 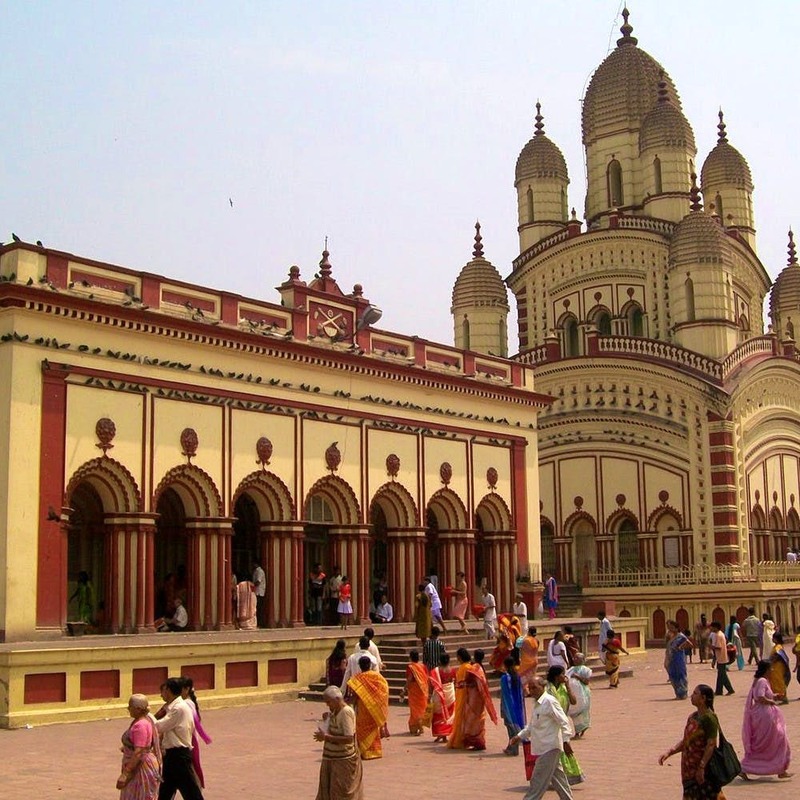 The temple of Dakshineswar is also famous for its connections to the mystic saint Ramakrishna Paramhans. One of the earliest priests who had served in this temple, Ramakrishna’s room sits inside the temple premises and is open for all to visit. You can also visit the Panchavati Garden where Ramakrishna meditated under the congregation of five sacred trees. The Dakhineswar Temple has well-maintained private ghats open for devotees to take a dip in the Ganges. Alternately, you could go up to the ferry ghat and take a boat ride across the Hooghly to Belur Math. Or take one of the cruises by WBTDCL which start from New Babughat and travels to Belur Math and Dakhineswar. Like all touristy place, the stretch of road that leads to the temple corridor is lined with small eateries and food stalls. Don’t expect the fancy meals of restros because these are stalls that serve up sumptuous Bengali stall food of kochuri and dal that’s best enjoyed when eaten with your hands. Oh, and don’t forget to try the rasgullas here. Like the slew of eateries, you’ll also find clusters of stalls selling bric-a-bracs lining up the road leading to the temple gates. From conch shells to rudraksh beads, small idols and religious curios, you’ll find several curious things to pick up. But please don’t go checking for authenticity here!